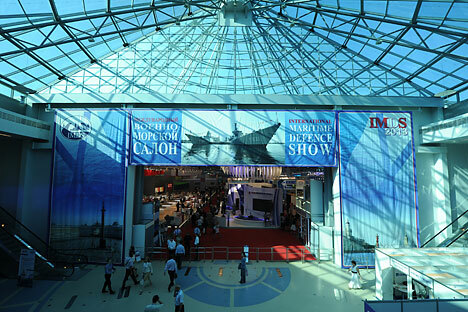 Top novelties of Russian "EURONAVAL"
St. Petersburg hosted the International Maritime Defence Show earlier this month. There were few foreign participants this year at the naval exhibition popularly called the Russian ‘Euronaval,’ for a variety of political and economic reasons. While there were few foreign manufacturers of naval equipment and weapons on the list of exhibitors, domestic companies were present in numbers to display their latest wares. Some of the the show’s highlights are featured below. The United Shipbuilding Corporation and other domestic shipbuilders at the ‘Euronaval’ 2015 displayed, among other features, the design of a surface battle ship, multipurpose ‘Project 22356’ frigate, a modernized version of the Project 20382 corvette, a high-speed universal naval base platform "ICC-1200" with air cavities at the bottom, and a small coastal submarine called "Piranha-T."
The Russian Naval departments had on display several dozen ships and motor boats of various purposes at the outdoor exposition. The most interesting models among these were the latest diesel-electric submarine Project 636.3 "Stary Oskol"; Project 20380 corvette "Stoykiy"; a family of motor boats project 12150 "Mongoose", Project 03160 patrol boat "Raptor" - armed with a unique remote-controlled unit with an automatic grenade launcher, Project 21980 anti-seal "Grachonok" and others, as well as the basic minesweeper of the new generation - Project 12700 "Alexander Obukhov". Its distinctive features comprise a full fibreglass body, various trawls and remotely operated and autonomous underwater vehicles. A major focus of interest was the proposed aircraft carrier, called the Project 23000E "Storm". While the country’s defence procurement programme does not provide for building an aircraft carrier before 2018, it attracted considerable interest among visitors. Judging by the model, the proposed "Storm," with a displacement of about 100,000 tons, will have two ski-jump ramps (in the nose and in the corner flight deck) and two catapults, which will allow it to lift various types of aircrafts, including the naval version of the 5th generation fighter, and the airborne early warning and control aircrafts (AWACS). The Russian "Storm’s" air component can include up to 90 aircraft and helicopters of various types. Flight control would be regulated from two control towers located on the vessel. The carrier would have an atomic power plant to fuel it, allowing the vessel to use mass drivers on the ship. The development of the latter is said to be on in full steam. The plan is to equip the carrier with a nuclear reactor, which would be tested earlier on a proposed Russian destroyer of the "Leader" class. Another proposal being considered is to use a combined main power plant, including both nuclear and gas turbine units, on the aircraft carrier. This would provide the carrier with the possibility of "quick start," through a gas turbine plant quickly set in motion, while the nuclear reactor would fuel operations in the sea, allowing the aircraft carrier go travel at good speeds. The serial production of a ship version of the famous anti-aircraft missile and gun, the "Pantsir-C1," was also announced at the exhibition by Alexander Zhukov, chief designer for sea-based air defence systems Instrument Design Bureau (named after Shipunov). "The complex will be put into serial production," - he told the TASS news agency. The missile and gun complex has been named “Pantsir- M,” and can be equipped both with missiles from its onshore counterpart and the proposed guided missile "Hermes-K," on which targets can be fixed even using data received from UAVs. The weapon can shoot artillery fire through enemy air attacks. Ships with medium and large displacements can carry few such modules of weaponry together, the “Pantsir-C1” contains 32 missiles. The export version, the “Pantsir-ME," also displayed at the exhibition aroused great interest both among traditional defence partners of Russia (because the maritime “Pantsir-ME” can replace similar systems, mounted on Russian-built ships, in service in foreign fleets) and among other potential buyers.